These days, many people rely on tax software to prepare their taxes online but nothing beats the real world experience and personal touch of a local tax professional. Our Bellevue, WA CPA firm provides superior income tax preparation for businesses and individuals along with friendly customer service. 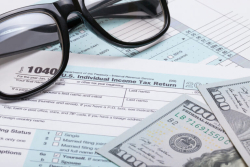 We take the guesswork out of tax preparation because we not only prepare and file your taxes accurately but we also make ourselves available to answer tax questions for our loyal clients. At GDM Private Financial Solutions, we care about every client so we work hard to get you the kind of tax savings you can take to the bank. As regulations change, we identify new deductions and incentives that can reduce your overall tax burden and bring you a higher tax return. Best of all, we make it easy. Just bring us your paperwork, receipts, and prior tax returns and we'll do the rest. Business tax returns – Corporations, S Corporations, Partnerships, LLC, etc. You earned it and we'll help you keep it! Contact our tax accountants today to learn more about how we can prepare your federal and state tax returns. Call 425-283-5425 now or request your free initial consultation online.